Riding a bicycle forces you to contend with traffic, miserable weather and even the odd overly aggressive dog. Hop on an exercise bike, however, and you've got all the fitness benefits of a pedaling workout without any of the fuss. 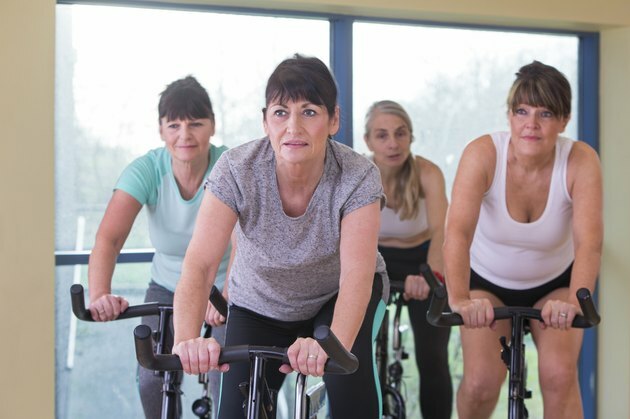 Riding an exercise bike can help you burn hundreds of calories an hour, making this exercise a potentially valuable addition to any weight-loss or weight-maintenance workout routine. Just be sure to consult your doctor before beginning this or any exercise regimen. Your weight and pace dictate how many calories you can expect to burn on an exercise bike. According to HealthStatus, a 145-pound person burns around 231 calories in 30 minutes of pedaling moderately and around 374 calories in 30 minutes of pedaling vigorously. During the two workout tempos, a 195-pound person burns about 310 and 503 calories, respectively. In addition to its convenience-related benefits, using an exercise bike can improve your cardiovascular fitness and strengthen your muscles. Because your feet stay pressed against the pedals, this exercise generates a low impact to your lower-body joints. Exercise bikes are programmable for every fitness level and allow you to enjoy variety in your workouts through the use of preset workout routines.